Boss Resources (ASX:BOE) is making significant progress on its Honeymoon Uranium Project – one of only four fully permitted uranium projects in Australia – and expects to deliver further positive results in the near future with the financials to match. The biggest recent news of late came in June when BOE delivered a maiden JORC Inferred resource at its Jason’s Deposit at its Honeymoon Uranium Project. No less than three significant resource upgrades have been delivered in the last six months, and there is still more resource growth to come for BOE, which we are sure will be highlighted at the Diggers and Dealers conference where Executive Director Grant Davey is presenting this week. BOE is continuing to extend and upgrade its resources, with infill drilling to start at Jason’s Deposit in Q3 2016. But this upcoming high impact drilling could add another 15-20 million pounds to the resource very quickly. BOE is eyeing a Definitive Feasibility Study by the end of 2017 and is planning to start producing in mid-2019 with a production target of 2 – 5 million pounds per annum outlined. Further highlighting BOE’s confidence in its Project is how it compares to its nearest peer, Berkeley Energia (ASX:BKY). In fact the $46M capped BOE is on a similar trajectory to more advanced $167.5M capped Berkeley Energia, with both sharing low capital and operating costs. BOE is currently undertaking a study led by GR Engineering that will optimise and reduce costs for the planned expansion, whilst minimising start-up issues for the processing plants. BOE has identified that a larger processing plant facility could significantly reduce the cost of production. Results from the expansion study are due in Q3 2016, making the current quarter a very big one for the company. The potential reduction of costs piqued our interest as to what BOE’s costs may look like. At the same time, we are making a number of assumptions in arriving at the below calcs, and there is no guarantee they will eventuate. Having done some quick calculations of our own, we expect the LOM (life of mine) OPEX (operational costs) to be in the vicinity of US$14.32 per pound. Now assuming a LOM U 3 O 8 spot price of around US$64.47 per pound and you have a pretty impressive potential margin, especially when you consider we could see a doubling of uranium prices by 2018 – just as BOE would look to edge closer to production. Further comparison leads us to Berkeley’s Salamanca Project’s Net Present Value (NPV) of US$353.5 million with an internal rate of return of 54% based on a discount rate of 8% and a long term uranium price of US$44 per pound. Our own rough calculations based on BOE’s expected costs and resource size reveal the company is creeping closer to Berkeley with an expected NPV of approximately $471 million. The maths for Berkeley is pretty impressive and BOE hopes to emulate these kinds of financials as it makes its charge up the peer comparison ladder. With numbers seemingly improving by the day and further exploration and an expansion study of the resource underway, it is expected that BOE’s news flow will continue apace, and its goal of delivering a Definitive Feasibility Study by the end of 2017 remains on track. If that is the case, then BOE could reasonably expect a re-rate as it quick-steps its way to the next phase of its life and edges closer to the likes of Berkeley and beyond. 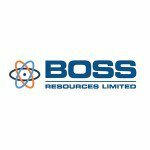 Boss Resources (ASX:BOE) is one of the fortunate holders of one of only four permitted uranium projects in existence in Australia, a project where already $170 million worth of plant and infrastructure has already been installed. We first covered BOE in the article ASX Junior Triples Resource Size After Opportunistic Energy Acquisition , where we looked at BOE’s acquisition of the Honeymoon project in South Australia, what the project consists of and the significant history of this asset. What we found were significant emerging catalysts, some that are currently making themselves known. As we stated back then, BOE became an advanced uranium developer simply through the astute acquisition of the Honeymoon uranium mine. And so far, the decision to acquire this project is looking like it will pay off. Recently, BOE announced a maiden JORC 2012 Inferred resource of 2.8Mt at 840ppm eU 3 O 8 for 5.2 MlbU 3 O 8 for its Jason’s Deposit at the Honeymoon Uranium Project. It was the third substantial Resource upgrade for the Honeymoon project in six months and it means the Global Mineral Resource now stands 3.5 times larger than the original resource at acquisition. Meanwhile, resin based metallurgical test work is being carried out from the Honeymoon Uranium project to see if it would be suitable for an ion exchange process. BOE also recently raised $1.25M (before costs) via a placement of 31,250,000 million ordinary shares at an issue price of $0.04 cents. A further 18.75 million shares will be placed to professional and sophisticated investors, but are not to be disposed of for 12 months. In a positive sign for the rest of the BOE register, we understand that these shares are in the hands of long-term holders , who want to see this story play out to its fullest. BOE plans to use an ion exchange process at the Honeymoon Project. BOE has been working with a world leading uranium processing firm, the Australian Nuclear Science and Technology Organisation (ANSTO). So far ANSTO has completed two resin tests that have both come back positive, which align with BOE’s aim to reduce operating costs using the ion exchange method. The ion exchange process involves injecting acid below ground to soak up and collect uranium mineralisation. The solution is then brought back to surface and processed. Test are ongoing in conjunction with the expansion study. Those results were encouraging and additional test work could result in further reductions to project OPEX (operating expenditure), as BOE looks to identify the optimal pathway for the re-start of the Honeymoon mine. Engineering designs are now imminent and additional resource drilling is expected to commence within the Eastern tenements in quarter 3, 2016. Those are positive words from Davey about the project, in particular the resource upgrade, and the direction in which BOE is heading, so let’s take a look at the project in more detail. As we indicated earlier, the Honeymoon Uranium Project was successfully acquired from Uranium One Australia in late 2015. 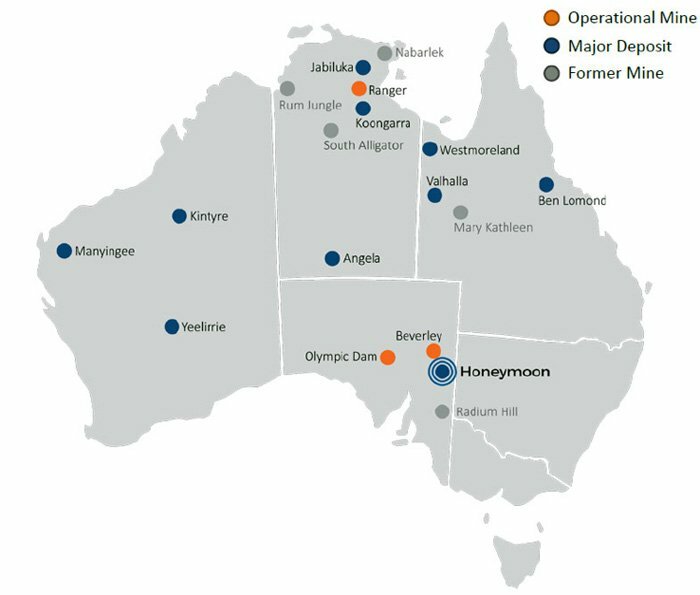 Located in South Australia, 75 kilometres northwest of Broken Hill, the Honeymoon Uranium Project consists of 1 granted mining lease, 5 granted exploration licenses, 8 retention leases and 2 miscellaneous purposes leases. Eastern region (ELs 5215 and 5612) which hosts the Honeymoon, Brooks Dam, East Kalkaroo and Jason’s Resources. Western region (ELs 5043, 5623 and 5622) which hosts the Gould’s Dam and Billeroo deposits. 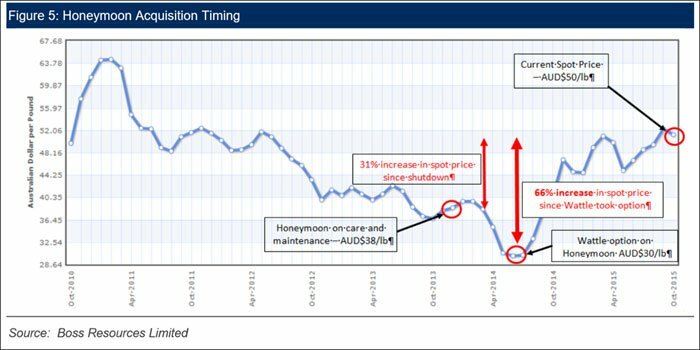 Previous production had commenced at the project in 2011, however due to the prolonged drop in Uranium prices following the 2013 Fukushima disaster, the Honeymoon Mine was placed on care and maintenance. The market for uranium has since been renewed, and you can read about this further down in this article. Consequently there is already $170 million worth of plant equipment and infrastructure in place at the Honeymoon project from the Uranium One Australia acquisition. The infrastructure itself has been kept in excellent condition since production ceased and will require little if any capital to restore it to a working level according to BOE. With infrastructure in place, BOE can focus its efforts on sizing up a commercial grade resource rather than be bogged down with construction and the setting up of facilities in the area. 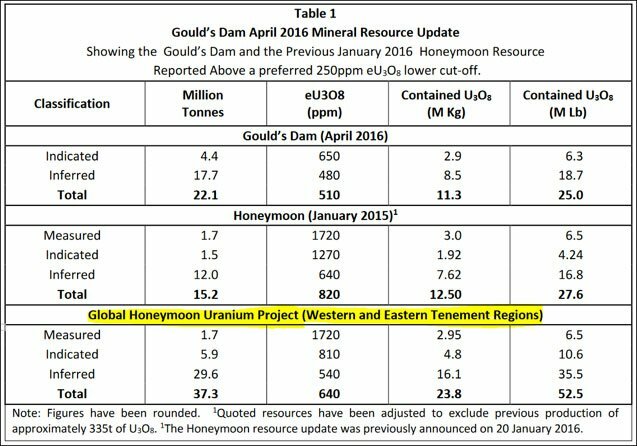 The Honeymoon Uranium Project hosts BOE’s three deposits, all displaying very strong characteristics. Let’s start with Jason’s Deposit. BOE announced a maiden JORC 2012 Inferred Mineral Resource of 5.2Mlb U 3 0 8 at the Jason’s Deposit in the Honeymoon Uranium Project. 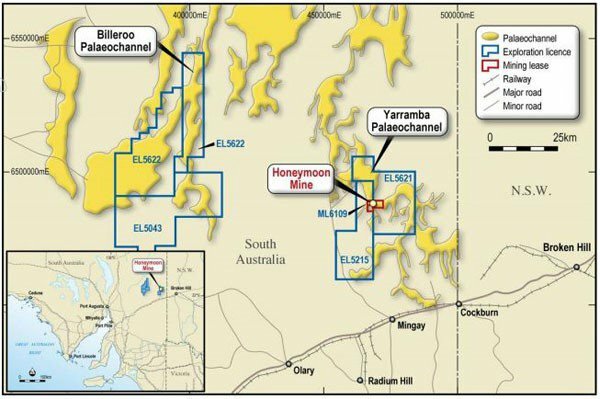 Jason’s Deposit sits near the 27.6Mlb Honeymoon deposit on the Yarramba palaeochannel, with the third Gould’s Dam containing 25Mlb based on current evaluation. With consistent news flow coming out of high grade resource expansions at the Honeymoon Uranium Project, BOE is hoping to hit a note with investors here too. Further results from the exploration and resource upgrade study are expected August 2016, which could see the market rise to BOE in a standing ovation. Of course this is still an early stage play and all facts should be weighed up before making an investment decision with regard to this stock. Seek professional financial advice for further guidance. The management team at BOE have methodically planned out the steps to their end goal of bringing a resource to market. With the completion of the Definitive Feasibility Study expected at the end of 2017, production on the site is projected to begin mid 2019 with a production target of 70-100 million pounds per annum outlined. In April BOE added Mark Hohnen to the team as Chairman. Hohnen was the founder of Kalahari Resources which was involved in the discovery of Husab uranium resource in Namibia and was ultimately acquired by China Nuclear Power group for US$2.2BN. Mr Hohnen has vast experience having been involved in the mineral sector since the 1970s and is currently on the Board of Swakop Uranium, the owner of the Husab Uranium project, the world’s second largest uranium operation in terms of production, with the construction of a 15mlbs uranium per annum mine and treatment plant nearing completion. Suffice to say he knows a thing or two about nuclear. And he sees something in BOE. Mr Hohnen has invested $500,000 into BOE via a share subscription at 3c per share, so the very fact that he has put his cash down means he expects results, which could come if all macro and internal moons align. At present nuclear power provides about 11% of the world’s electricity and 21% of the electricity in OECD countries. Demand growth is driven by emerging markets, particularly out of Asia where their rising middle class and population expansion are placing strains on current energy supply. At present there are 65 nuclear reactors under construction in 14 countries with the principal drivers of this expansion being China (24 reactors under construction), Russia (8), India (6), the United States (5), South Korea (3) and UAE (4). Based on the most recent statistics from the WNA, there are a total of 238 reactors that are either under construction, or planned around the world, and an additional 337 reactors that are proposed, with the potential to be operating by 2030. With China alone set to build an additional 40 nuclear power plants over the next 5 years, India is not too far behind with over 30 reactors in the pipeline. Another driving factor in today’s society is the growing concern surrounding climate change. Uranium can supply energy for the world’s electricity with less greenhouse effect than many other traditional energy sources. Both China and India are leading the way in seeking nuclear energy to reduce carbon emissions. With hundreds of billions of dollars being invested around the world into nuclear facilities that are under construction around the world and a move away from coal due to environmental concerns, uranium is set for a substantial increase in demand over the coming years. One would have to assume that if governments around the world are spending that much money on nuclear infrastructure, policies related to nuclear energy will also remain favourable to the sector going forward. Note: this is not to say that a Fukushima level event isn’t a major environmental issue, however barring unlikely events it is far cleaner than coal, which is a heavy polluter in its standard day-to-day operations. 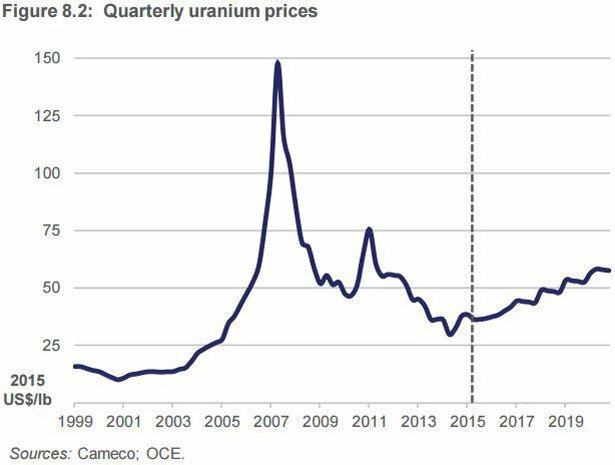 The spot price of uranium saw massive changes from 2003 to 2007 where it climbed rapidly from $10 to peak over $140. This was partly due to flooding at the Cigar Lake Mine in Canada which is the world’s largest undeveloped high grade uranium deposit. However in more recent times demand has been driven on a more sustained fundamental level from global nuclear projects primarily from both India and China, leading to an increase in demand for uranium. Should the price of uranium rise as anticipated, stocks with exposure to uranium are likely to experience a leveraged effect. We saw this in the lead up to the 2007 bubble where uranium stocks took off, conversely when the price of uranium crashed many exploration companies and junior developers were halted in their tracks and had to seize operations. This too was seen in the market following Fukushima. Bar another major environmental disaster or revolutionary energy technology coming to market that can service large populated areas, we here at The Next Mining Boom believe the case for uranium as a component of the world’s energy mix going forward is strong. Should demand and in turn price of uranium rise as anticipated, BOE will be in an opportune position to supply the market when many of the current nuclear power plants around the world will be completed and many more still under construction. Hence anticipating the growth in the sector. With hundreds of billions of dollars being invested by governments into building nuclear infrastructure to cater for increasing energy demands, governmental regulations are likely to favour the industry. And that is good news for BOE and its shareholders.